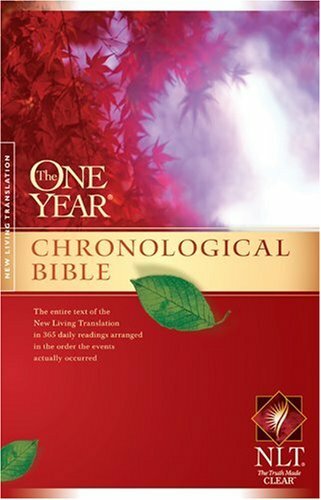 This year I have been reading my way through the Bible using the One Year Chronological Bible. I usually read through the entire Bible every other year, but this is the first time I’ve read a chronological version and I really like it. When I was reading about David, I could read the Psalms he wrote during each time in his life. For Solomon, I read about his tremendous wisdom, then went straight into Proverbs. I read about his wealth, and then the conclusions of “The Teacher” of Ecclesiastes, that everything under the sun is meaningless. Now I’m reading about the divided kingdoms of Israel and Judah, and I love that the prophetic books are inserted right after the historical account. For example, I read 2 Chronicles 26:23, “When Uzziah died, he was buried with his ancestors….” and went right into Isaiah 1:1: “It was in the year that King Uzziah died that I saw the Lord.” Reading the Bible chronologically has really helped me connect events to context. If you have never read a chronological version of the Bible, I would encourage you to try it as an alternative to cover-to-cover reading.